This postcard dates from about 1906, and shows the four-story People’s National Bank, located on the northwest corner of 2nd Avenue at 18th Street. Its publisher has carefully removed the surrounding buildings from the picture and has depicted the building as white. Ladies in long skirts and fancy hats chat on the corner, while the gents stand in the middle of the street, their carriages tethered nearby. The building is still there, with its upper portion looking like it does on the postcard. Over the years, both the use and appearance of this historic building have changed. It was built about 1876, as a three-story building with round-topped windows in the Italianate style, and looked similar to the Star Block located a block east. The street floor on the east side was the home of the First National Bank from 1876 until 1890, when it went out of business, while the west side of the first story was used for retail purposes. After the demise of First National, its space was rented to People’s National Bank who later purchased the entire building. The second floor was originally used for offices while the third story held the International Order of Odd Fellows lodge and meeting rooms. Entrances to the upper floors were, as they are now, from 18th Street. People’s National Bank had been organized in 1874 with Bailey Davenport as its president. Its board of directors included many local gentlemen of wealth and prominence whose names are still familiar to us – George Wagner, F. C. A. Denkmann, August Huesing, Peter Fries, and Ignatz Huber among them. People’s was a very successful bank. Although reports vary, in either 1904 or 1911 the bank purchased the building it had rented. Early in the twentieth century, the building underwent its first major renovation and reconstruction. A fourth story was added, probably designed by local architectural firm of Drack and Kerns. At the same time, the windows were enlarged and squared off. Huge plate glass windows were installed on both 18th Street and Second Avenue and the bank entrance was moved to the corner. The interior was reconfigured as well, an elevator was added and the stairway to the upper floors was modified. Massive vaults (safes) were added on each floor as well. This is the appearance we see portrayed on our postcard. In 1911, the bank retained local architect George Stauduhar for another extensive remodeling project which included a complete reconstruction of their Second Avenue storefront. The entrance was centered in the Second Avenue to permit the bank to use the entire first floor of the building. Columns framed the new doorway, giving it a much more “bankish” appearance. Plans for this remodeling are in the University of Illinois Archives. In July of 1911, the Argus reported that the bank had opened in redecorated and enlarged quarters. Shortly after the 1911 remodeling, People’s formed another bank, the German Trust & Savings Bank, which shared space with People’s. During World War I, German Bank changed its name to American Trust & Savings. The 1920s saw many mergers and consolidations throughout the banking industry and these banks were not immune. In 1927, both People’s and American became part of the newly organized Manufacturer’s Trust & Savings Bank, and our building became known as the Manufacturer’s Building. 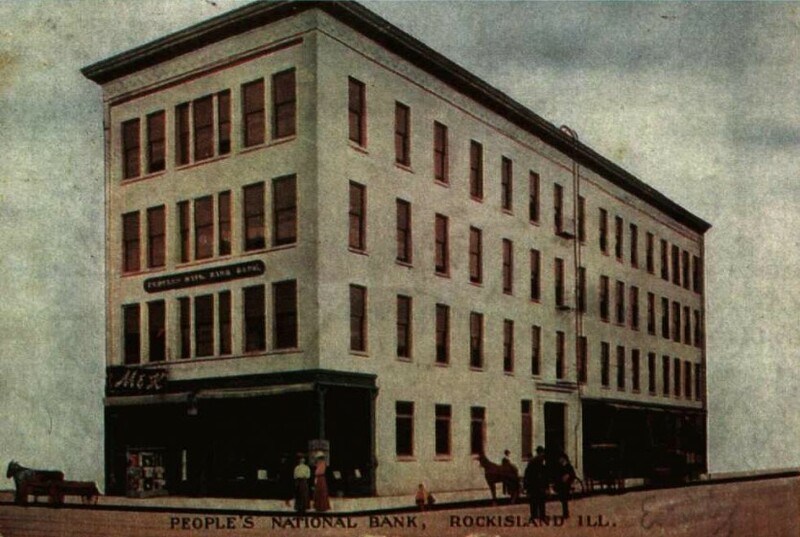 Finally, in 1931, Manufacturer’s consolidated with the Rock Island Savings Bank (another postcard article), and Central Trust & Savings to form the Rock Island Bank & Trust Company. Offices for the new bank were on Third Avenue and 18th Street. Although still called the Manufacturer’s building after the bank left, the street level was continuously used for retail – McCabe’s, David’s, New York Store, and Walgreens among them. As the retailers flourished, they needed more space. To gain space, the walls separating this building from the Fries building to the west were opened, effectively joining the two. As a result, although People’s and the Fries Building appear on the exterior as two separate structures, they are actually considered as a single building. Historically, the upper floors on the east were used for professional offices – doctors, lawyers, dentists, etc. — until the mid 1970s when the last office tenant left. Department stores had long before vacated the western portions of the upper stories. Fifteen years later, the last retail tenant, Walgreens, left. For several years, the entire building was vacant and its future was uncertain. In 1992, the Development Association of Rock Island stepped in to purchase the building and once again give it a new life. Their first goal was to rejuvenate, restore, and rent the street level storefronts. This project was completed in 1995. But that still left lots of empty space in the upper floors of the building. Circa 2000, in a leap of faith and construction that preservationists call “adaptive reuse,” the former department store and office space was converted to loft apartments. Adaptive reuse simply means using a historic building for a purpose other than what was originally intended. No longer offices and department stores, this wonderful old building was reinvented as 23 loft apartments. The project, a cooperative effort of Rock Island Economic Growth and Brinshore Development of Chicago, created dramatic loft spaces of many sizes on the upper floors of the Renaissance Building, as the joined People’s National Bank Building and the Fries Building is now known. Since 1999, the Renaissance Building has been listed on the National Register of Historic Places. Therefore, the developers decided to incorporate important original building materials into the innovative floor plans of these apartments. They designed living spaces that project the warmth of the vintage – tall wood doors and woodwork, tile flooring, an impressive central stair tower — while being outfitted with the latest in modern and high tech amenities. Even the old bank vaults are still there. This article by Diane Oestreich is slightly modified from the original, which appeared in the Rock Island Argus and Moline Dispatch on January 13, 2002.